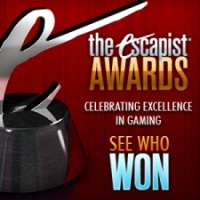 The winners of our 2009 The Escapist Awards will be announced on Friday. The Oscars have come and gone. All of the Golden Globes have been given out. The Darwin Award-winners received their just deserts. All that remains is to find out which games of 2009 will be honored with The Escapist Awards. The Escapist Awards recognize excellence in creating games but also how games made us feel. Our three broad categories cover Overall Excellence, Professional Excellence and Experiential (that elusive emotional attachment we experience when playing games) and we've nominated what we thought were the best games for 40 different awards. The nominees are listed here. Because 2009 marked the end of a decade, we are also paying homage to the game that we believe was the greatest and most influential game made in the last ten years. Our nominees for the Game of the Decade are: World of Warcraft (Activision/Blizzard), Halo 2 (Microsoft), Grand Theft Auto III (Rockstar Games). We will be announcing the winners of this and all of The Escapist Awards on Friday morning. Check back to find out which games will take home the coveted "e" and read the comments from our editors. And, of course, feel free to tell us whether or not you agree. After all, that's most of the fun.